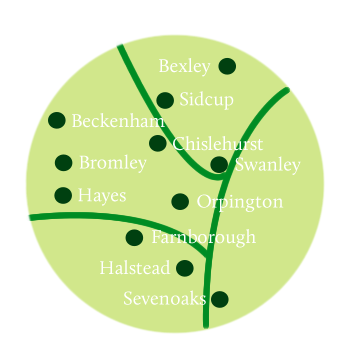 Based in Orpington, we work throughout Kent and the outskirts of London, including Bromley, providing homeowners from across the region with the very best bathroom installations, new central heating systems, new shower installations and bathroom design services. Below, you can see a few comments from just some of our satisfied Bromley customers. “Just wanted to say a huge thank you to you and all the lads for such a terrific job on my new shower room! It’s usually a bit of a pain having builders in but everyone was really friendly and we ended up having quite a giggle. The finished job is absolutely perfect and just what I was hoping for, it’s lovely having at least one room in the house perfect! "You recently installed our new shower and bathroom suite and we wanted to thank you for the wonderful job you and your team did. We really didn’t expect to get the opportunity to see everything designed out on your computer first and the opportunity to play around with the design and layout ended up with it completely different to what we planned! “Hi, you did a great job on the new bathroom, it was nice to get someone who didn’t mess around trying to sell me things I didn’t want or need; your guys did a quality job and didn’t mess around and the suite is ideal for the property.